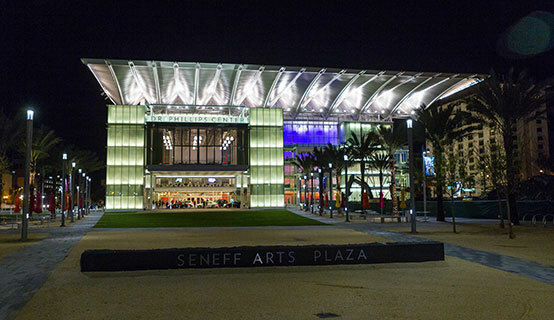 In early September, Mayor Teresa Jacobs sent a letter to the Board of County Commissioners (BCC) announcing her support for an additional $45 million of Tourist Development Tax (TDT) funding to complete the second and final stage of the Dr. Phillips Center for the Performing Arts (DPC) and to establish a sports bid fund in the initial amount of $5 million with annual replenishment amounts of up to $2 million. Mayor Jacobs also outlined an option the county has under the venues agreement to prepay the city’s contract TDT debt with county refunding debt, which would then free-up substantial TDT funding so that the BCC could consider other spending priorities. After receiving strong support for the Mayor’s TDT plan from the hospitality industry and the Tourist Development Council, the BCC unanimously approved this three-part proposal on November 1. “Today’s decision is creating a new chapter in Orange County’s history and will continue our vision of making our community the best place to live, work and raise a family,” Mayor Jacobs said. The approved plan is an efficient way to take advantage of tourist-generated taxes and will not raise taxes or financially impact local residents. The TDT is a 6 percent tax on short-term lodging, such as hotel rooms. The additional $45 million in TDT funding for DPC will allow for the completion of Phase II of the DPC, called the acoustic Steinmetz Hall. Since opening in late 2014, the DPC has become one of the most celebrated artistic centers in the nation. The acoustic Steinmetz Hall will be the home of local performers, including the Orlando Philharmonic, the Orlando Ballet and Opera Orlando. Phase II will break ground in 2017, with an expected grand opening in 2020. In late January, the NFL Pro Bowl will be played right here at the Camping World Stadium. With the substantial TDT investments that the county has made in our world class sporting venues, we have raised our profile as a place to host major professional and amateur sporting events. The establishment of a consolidated and dedicated sports bid fund under Visit Orlando will ensure that we can compete for the most beneficial and desirable sporting events for many years to come. Finally, over the last year, the county has heard presentations from our convention center regarding their campus master plan, which includes several proposed large capital projects to meet the needs of their customers. The county has also heard from the hospitality industry and the arts community about their requests for TDT funding for capital and operational needs. Prior to the Mayor’s TDT plan being approved, there was no additional funding to address these additional requests. With the restructuring of the community venues debt, there will now be additional funding so that the BCC can consider other spending priorities.